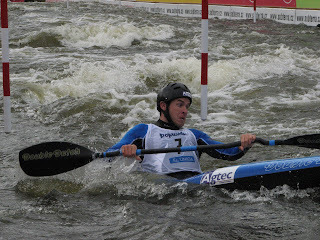 A few weeks ago, Eoin Rheinish, the country's top slalom kayaker, was sitting in his boat on the river Sava in Tacen, Slovenia. He had just steered his boat over the impossible drop at the top and let it flow through the boiling whitewater and treacherous stoppers on the way to the bottom. "I was sitting there thinking how lucky I am. I just love what I do and I am so fortunate," he says. Rheinisch, now aged 28, was born on the banks of the Liffey and like many others from the same background, spent most of his free time as a youngster messing about on the river. Along with his brothers, he started slalom canoeing with the Salmon Leap club in Leixlip at the age of 13. In a family of four boys, all are canoeing mad. "Aidan was competing on the international circuit until the Athens Olympics and Eamon is on the Irish squad now," says Rheinish. Oldest brother David was also involved. Good canoeists develop a feel for the water. "The big mistake is to attempt to overpower the water. You have to get on the right lines and let it push you. You learn to use the water, not fight it." It takes time, passion, and many hours of practise. Rheinish qualified for the Athens Olympics by beating his older brother Aidan and Neil Caffrey in three World Cup races leading up to the Games. His finest moment came at the Barcelona Olympics course in Seu d'Urgell, Spain, where he not only beat his two Irish teammates but won the race. It meant that his 21st at the Olympic Games in Athens came as a crushing disappointment. "I was in great shape and I had won a World Cup. I think that's why I carried on - I knew I was better than that." After a few months break, he decided to keep going. Support from the Irish Sports Council and from Agtec, a telecommunications company based in Ashbourne, Co Meath, helped ease the financial burden of living out of a suitcase for a further four years. By the year 2006, Rheinisch was back on track with three top ten finished at World Cup events, and a world ranking of seven by the end of the year. Last year, he finished sixth at the European Championships in Liptovsky Mikulas, Slovakia, despite a last minute dash back to Ireland when he discovered that his boat had been completely destroyed by the airline en route. "When I arrived in Krakow and got my luggage something didn't look quite right with the shape of my boat bag. I took my race boat out of its bag and the extent of the damage was huge. It really knocked the wind out of me. After a few minutes, I decided to fly home and get my other boat after phoning my brother Eamon. When I got back to Dublin at midnight, the pair of us stayed up until 3am trying to get the boat right. A few hours sleep and I was back on a plane to Krakow, arriving and 9pm and then checking out a rental car for the two and a half hour drive to Liptovsky Mikulas." The nightmare wasn't quite over. The next morning, Rheinish discovered that the new boat was also damaged. Fortunately, the damage wasn't too serious this time and with a few adjustments, Rheinish produced his best performance at a European Championships. 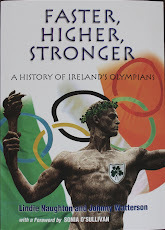 He went on to seal a place for Ireland at the Olympics when he finished 17th at the World Championships in Brazil after more repairs to his new race boat, again damaged en route after a trip to Beijing - the fourth time in a year his boats had been damaged by airline handlers (and they did it again after a training camp in Beijing later in the season). When it came around to the series of races to decide who would take up the Olympic place, two others were in contention. Neil Caffrey had won Ireland the place for 2004, while 20-year-old Ciaran Heurteau is looking towards London in four years time, but already posting world-class results. "I was fortunate to nail down my place after a stressful weekend of racing at the Pan American Championships in Charlotte, North Carolina. So the pressure was off for the European Championships." Unfortunately, the constant stress and travel took its toll and Rheinisch fell ill. "Well I guess a trip to Beijing for seven days training, flying back to Ireland for four days, then a flight to the USA, followed by a seven hour drive, a weekend of racing for Olympic Selection, followed by another seven hour drive, a flight back to Ireland, four days at home, and a flight to Krakow takes its toll!" Although he has been competing on the World Cup circuit since then, all his focus is on Beijing. "I've done every training camp available on the Beijing course at Shunyi since the test event last August and I'm very happy with how it's gone. I love the course, which is very technical and the big water suits me. Over about 350 metres, it has 5.5 metres of gradient and 17 cubic metres of water flowing down it per second. "The course has two main drops, with the bigger second one having a powerful hole at the bottom. With the water shifting from side to side and so many stoppers and curly waves, it's a real challenge to find the right line." Completing a run takes between 90 and 100 seconds, after which the paddlers can take a conveyor belt back to the top. His main rivals are likely to come from Germany and France, with Erik Pfannmoller of Germany winning the World Cup series and his team mate Alexander Grimm leading the world rankings. Also worth watching out for is Campbell Walsh of the UK, who won the silver in Athens. "My main target is to make the final, but it will be tough. Sometimes the water just doesn't go your way. If I can do good runs I will be happy." * First held in 1972 at Augsburg in Germany and then from 1992 until the present day. * Three classes K1 (paddle with a blade on each end), C1(paddled with one blade, canoeist kneels), and C2 or Canadian pairs. * Between 20 and 22 will start in the men's K1 class. After two runs on the first day, the top 15 progress to the semi-final on the second day. A further five are knocked out after the semi-final, leaving 10 to race the final run. Times from both semi-final and final runs are added together to decide the placings. * Watch for: Michal Martikan v Tony Estanguet in the men's C1. Five times world champion Martikan from Slovenia took gold in Atlanta at the age of 17 but finished second behind Estanguet in both Sydney and Athens. In Athens, Martikan looked to have won, but a video review of his run confirmed that his helmet had touched a gate. The two second penalty put him 12 hundredth of a second behind Estanguet. Also: Britain's Campbell Walsh in the K1. Competitors must paddle down a 350-400 metre stretch of wildwater, passing through 18 to 25 "gates", of which at least six must be negotiated upstream. Hitting either of the two gate poles will cost two penalty points; missing it altogether (or negotiating it underwater) costs 50 penalty points. Each penalty point equals one second. 1992: Ian Wiley K1 8th; Mike Corcoran 12th. 1996: Ian Wiley K1 5th, Andrew Boland K1 40th , Mike Corcoran C1 10th, Stephen O'Flaherty C1 25th. 2000:Ian Wiley K1 16th, Eadaoin Ni Challarain women's K1 18th. 2004: Eoin Rheinish K1 , Eadaoin Ni Challarain women's K1 11th.